I have been busy on the homestead, doing anything but posting here on the blog, as you might well have noticed. This here is what is called a “slow blog” – sometimes I’ve got more work than words! I appreciate all of you who bear with me. 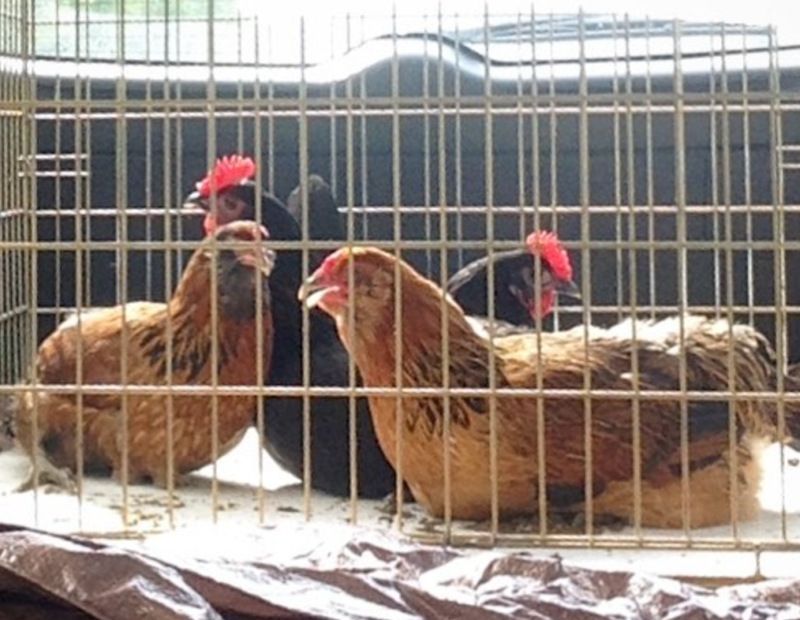 The first thing that’s kept my busy is our new residents…four lovely laying hens! It’s been a blessing having chickens again – it’s been a few years since we maintained a wee flock. I love the ritual that having livestock residents adds to my life. I must go out every morning and open their run, check their water and food, and listen to their gentle clucks. At evening, we go out and close their coop gate, check for eggs, and check their supplies again. They watch us with keen interest from the top-most roost in the coop, nestled together. So far, we’ve had between two and four eggs each day. These sweet girls are only a few months old, and they’re doing a good job. They’ve already decimated their run, those fussy little dinosaurs…so we’ll be learning about ways to control mud in chicken runs sooner than later. This past week ended with the Autumnal Equinox, and so we’ve been walking the yard, appraising our needs for our second winter here. This time last year, there were wildfires all around us…thankfully we’ve been spared that so far this year due to the regular rains. I’m counting my blessings and practicing gratitude, but also reeling from the difficulties faced by those around the world due to disasters and storms: Houston, Florida, Puerto Rico, all of the island communities, Mexico, South Asia, and even more. My altar is full of candles for these places and people, my heart full of ache at their losses. I do what I can to help, and in the meantime, I put myself to good work. Harvest season is upon us, and for us, that means bunches and bunches of herbs drying in every nook and cranny. The oregano and thyme both got a serious chopping, and so did the lemon balm. I’m sure we’ll get more from each of them before the first frost, too! I’m sure there’s more I’ve forgotten. I can’t help it, because I’m already looking past winter and into spring. I found packages of discount bulbs at the local Ace Hardware…mixed gladiolus and some red and black dahlias called “Scarlet Angel” that made my inner goth go batty. They can’t go in the ground until after the last frost in spring. Bit by bit, minor house improvements have been happening. I’ve put up a magnetic knife strip in my kitchen, which is fantastic! Even better than that is the SINK SPRAYER…I can’t believe I’ve done dishes for a year and more without having one of these. There’s more happening around the household, so be sure that I’ll be back with more recipes and techniques to spotlight. There’s jugs a-bubblin, yarbs a-dryin, and a very messy apothecary begging for a cleaning. So, you sensitive types out there, keep your heads up, your hearts filled, and don’t be afraid of tears every now and then – they are good for your eyes. The darkness cannot take us all. Reach out to me if you are in despair. I don’t have answers, but I have compassion and understanding of the energetic toll we are all paying in these times. Sow True Seed was founded in 2009 with the central mission of developing a regional seed system with open-pollinated vegetable, herb and flower seeds. We saw ominous threats to the security and health of our food systems and recognized that seeds were the root of the power. That is why we offer seeds that are always open-pollinated, untreated and GMO-Free. It’s an all-or-nothing campaign, and they’ve got less than a month left. The good news is that they are halfway there! A $10 donation gets you an ebook and a sticker, and the rewards get better from there. Take a look and donate to our seed and food diversity today! Homespun Seasonal Living has some freebies for you all…check it out! Embracing the Dark Days | A free e-course to inspire joyful, seasonal living in late fall. Get your own printable Food Preservation Tracking Sheet to keep track of what was preserved, how it was preserved, and when it was used it up.